Hurricanes are tropical cyclones that form in the western hemisphere and the Atlantic Ocean. Tropical cyclones are the most complex and powerful storm systems on Earth. They pack all the hazards of the planet's atmosphere: torrential rain, lightning, hail, high speed winds, and tornadoes. And they all begin with calm winds swirling over very calm, warm waters. 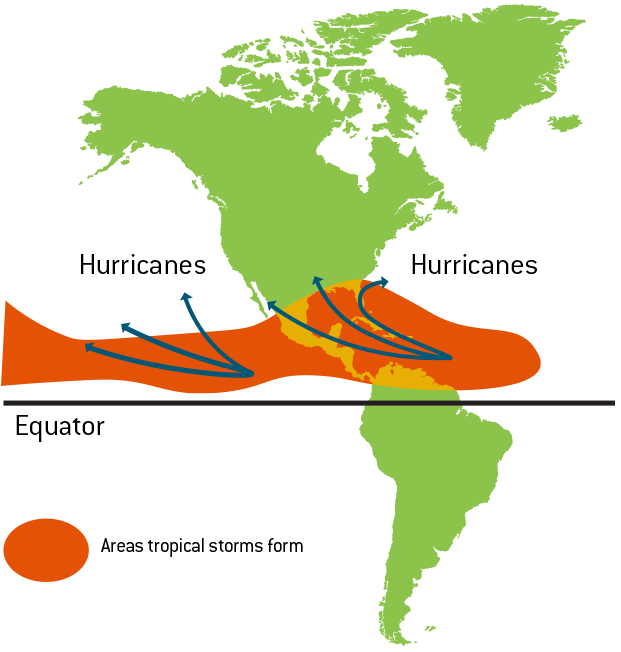 As seen in the image above, hurricanes in the Pacific ocean form in the waters off western coast of Mexico and often move northwest, further into the ocean. Hurricanes that do head to the U.S., often lose strength or dissipate before reaching the west coast due to cooler water and upper-level wind shears. Hurricanes in the Atlantic ocean however, often pose a much greater threat. This is greatly due to the dry, hot winds that are blown westward from the Saharan desert. Some of this hot, dry air evaporates the warm sea surface water in the Atlantic Ocean and forms clouds. More heat energy collects and builds more clouds. Moving westward, it becomes a tropical wave. Warm air rises, cool air sinks. This circulation intensifies, pulling in more moist warm air. The system strengthens into a tropical depression. As long as the storm passes over calm, warm water, there is a good possibility that it will grow to be a tropical storm. In rushing air brings more heat energy to the system. Water condenses out of the clouds as rain. 74 mph, the storm develops an eye-wall (a hollow, calm spot in the storm's rotation). It now becomes a Category 1 hurricane. Hurricanes form at different times depending upon where they occur. On average, the diameter of hurricane-force winds is about 100 miles. Slower speed winds further out from the storm center increase the storm system's diameter on average 300 to 400 miles across. 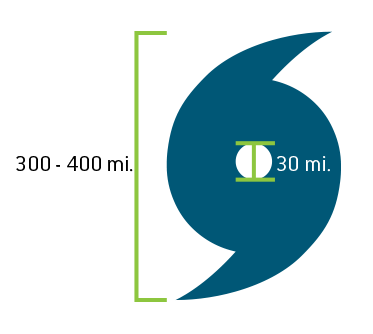 And the eye of the hurricane is 30 miles in diameter. How dangerous is a hurricane? A hurricane is dangerous no matter its size or strength. A hurricane's high winds, storm surges, heavy rains and tornadoes all pose a threat to anything in the hurricane's path. While that path varies from hurricane to hurricane, it is often the coastal states with heavily populated areas that bear the brunt of the destruction. Hurricane force wind strength is rated according to the Saffir-Simpson Hurricane Wind Scale. This scale estimates potential property damage according to the hurricane's sustained wind speed. Category 1 75-95 mph Very dangerous. Well-constructed frame homes could have damage to roof, tree branch damage. Some power loss. Category 2 96-110 mph Extremely dangerous. Homes sustain major roof and siding damage. Shallow rooted trees snapped or uprooted. Near-total power loss is expected. Category 3 111-129 mph Devastating damage. Major damage to house roof decking. Many trees uprooted or snapped. Electricity and water will be unavailable for several days or weeks. Category 4 130-156 mph Catastrophic damage. Many home severely damaged, most trees snapped or uprooted. Power outages extensive, lasting weeks to months. Category 5 157-mph Catastrophic damage. Most homes destroyed. Most of the area will be uninhabitable for weeks or months. In addition to high winds, a hurricane causes high tides. A normal ocean tide is about two feet tall. But when storm winds push up against the ocean surface, pulling up sea water, this forms a storm surge that piles on top of the normal tide. If a hurricane's winds add 15 feet on top of the normal two feet ocean tide, this produces a 17 food storm tide, which can very easily sweep away buildings, trees, cars, and people. Storm tide height also depends on whether the tide is high or low. The worst case is when a hurricane has generated a storm tide during a normal high tide. High tides carry storm surges higher and help send them further inland. How far inland do hurricanes go? Hurricanes can travel up to 100 – 200 miles inland. However, once a hurricane moves inland, it can no longer draw on heat energy from the ocean and weakens rapidly to a tropical storm (39 to 73 mph winds) or tropical depression. As hurricanes move inland, they unleash torrential rains, thus the greatest damage inland comes from flooding. Inland towns in mountainous regions are especially vulnerable to flash flooding. Rain strikes mountain sides and rushes down to the rivers, quickly inundating towns as it goes. Rain from Tropical Storm Bill (2015) dumped 10 inches of rain to west Texas, causing surging floods throughout creek and river valleys. Flash flooding in Austin and San Antonio metro areas required multiple high water rescues. Hurricanes and their remnants have struck every state in the Union. What are the warning signs of a hurricane? Since hurricanes develop in the ocean, it is easy to detect the coming of a hurricane before it hits inland. Weather forecasters will know several hours to several days before the arrival of a hurricane, providing ample time for preparation. Make sure to follow your local weather news channel for alerts. What is the life-cycle of a hurricane? 2 days before landfall: Conditions remain the same. This is when a hurricane watch is issued. 26 hours before landfall: First signs of a hurricane appear including falling pressure, light breezes, ocean surface swells of 10-15 feet, and white cirrus clouds on the horizon. 24 hours before landfall: Overcast skies, high winds, sea foam on the ocean's surface. It is best to remain indoors and make storm preparations. 12 hours before landfall: Thick clouds, winds increased to 70+ miles,and intense precipitation. 6 hours before landfall: There will be 90 + mph winds,the storm surge has advanced, and it will be nearly impossible to stand upright outside. 1 hour before landfall: There will be 100+ mph winds, 15 + foot waves, dropping pressure, and you will see flooding in low-lying areas. Landfall: This is when conditions will be at their worst at first wind, then the rain will stop and you will be able to see blue skies. The air remains warm and humid. Storm conditions will return once the eye has passed. Decide if you are going to take shelter in place or evacuate. 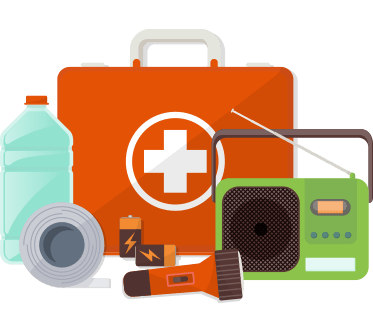 Prepare your disaster supplies kit. Locate a safe room in your home, preferably in the basement or under a room under the stairs, stay away from windows. Adjust refrigerator temperatures to the coldest settings to reduce the potential for food spoiling if the power is temporarily lost. Fully charge all your phones. Determine escape routes from your home and a nearby place to meet, these places should be measured in tens of miles. Don't leave cars parked under trees. Check to make sure pool covers are secure. Bring in plants, flags, house ornaments, outdoor furniture, and anything else that could be potentially hazardous. Make sure to have enough flashlights and batteries, stay away from candles as these could start a fire. Remove fuses from air conditioning system to prevent damage. Turn off water to prevent flooding from broken pipes. Local authorities have advised evacuation for your area. If you live on a barrier island with a history of storm surge damage. If you live in a low-lying or flood prone area. If you live in a mobile home in a coastal area. If your home is in a coastal area and lacks hurricane structural reinforcements. If you are vacationers with young or elderly dependents. Monitor the radio or television for weather conditions and updates. Do not go outside, even if the storm seems to have subsided. This may be the eye of the storm hitting landfall, which means strong winds and rain will resume shortly. Stay away from all windows and exterior doors and take shelter in a small, windowless room. If power is lost, turn off all major appliances to reduce the chances of damaging a power surge. Do not handle electrical equipment and do not use a landline unless it's an emergency. Listen to local officials for updates and instructions on what to do. Avoid debris and downed, damaged or loose power lines. Return home only when authorities have declared the area safe. 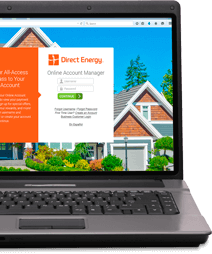 When power returns to your home, do not start all major appliances at once. Turn them on gradually to reduce damage to sensitive equipment. Even if you have ventilation, never use a generator indoors. This includes garages, basements and crawlspaces. Exhaust fumes contain high levels of carbon monoxide which can be deadly if inhaled. Even when left outside, keep generators away from doors and windows and at least 10 feet away from your home. Also, allow your generator to cool off before refilling it with gas – splashing gas on hot generator components can lead to a fire. Buis, Alan. "Could a Hurricane Ever Strike Southern California?" Jet Propulsion Laboratory - California Institute of Technology, NASA, 17 Oct. 2012, www.jpl.nasa.gov/news/news.php?release=2012-329. "Saffir-Simpson Hurricane Wind Scale." National Hurricane Center, National Oceanic and Atmospheric Administration, www.nhc.noaa.gov/aboutsshws.php. "Storm Surge Overview." National Hurricane Center, National Oceanic and Atmospheric Administration,www.nhc.noaa.gov/surge/.